A few weeks ago I wrote of the general election results in Sweden, which saw the return of the Social Democrats to power after eight years in opposition. The election also saw the shock rise of the right wing, anti-immigration Sweden Democrats party who came third. Two weeks on after negotiations Sweden’s new Prime Minister Stefan Löfven has announced his cabinet. Before Löfven could get to this stage he had to secure a governing coalition. The Social Democrats may have come out on top in the election however they only took 31.2% of the vote. 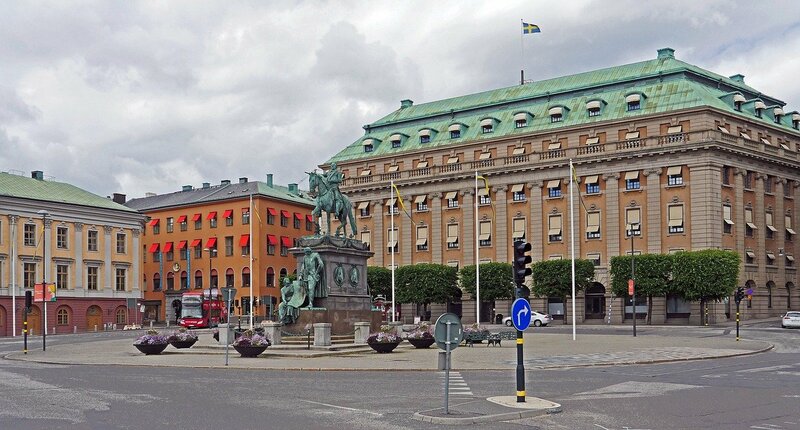 It was thought that the Social Democrats would revive the Red-Green coalition – which included the Green Party, who are the third largest in Sweden, and the Left Party. The Greens had done exceedingly well in the recent European elections, coming second. This time they were beaten into fourth place with 6.8% of the vote. The Left Party took 5.7% giving a Red-Green coalition 43.7% in the Riksdag, Sweden’s Parliament. The new opposition, comprising the Alliance parties made up of the New Moderates 23.2%, the Centre Party 6.1%, the Liberal Party 5.4% and the Christian Democrats 4.6% gave the Alliance a total of 39.3%. The rise of the Sweden Democrats saw them take a huge 12.9% of the vote, stopping either the Red-Greens or the Alliance from securing a majority. Sweden, though, has a system of negative parliamentarism, whereby a government can remain in office without a majority as long as there isn’t a majority against them. With the Alliance not showing any signs of allowing the Sweden Democrats to join their coalition, Löfven has the green light. Before the government was formed, Löfven had decided not to include the Left Party in his government after public disagreements with their leader, Jonas Sjöstedt, throughout the election campaign – in particular on his policy to ban private companies working with schools and hospitals to make a profit. This brings the Red-Green down to 39% – 0.3% less than the opposition Alliance. It is expected that the Left Party will vote with the government, with political pundits saying the party has no other option but to do so. Löfven had hoped to swing the Centre Party over to his coalition, but the Alliance stands strong and united. King Carl Gustav XVI opened Parliament and the vote for Prime Minister followed. Löfven got 132 yes votes with 49 no votes – 154 Alliance members abstained. Löfven then announced his cabinet, dubbed the Feminist Cabinet, with the ministerial positions split 50-50 for 12 men and 12 women. The Green Party’s co-spokesperson, Åsa Romson, becomes Deputy Prime Minister as well as taking the role of Climate and Environment Minister. Social Democrats Magdalena Andersson becomes Finance Minister and Margot Wallstöm becomes Foreign Minister. The Greens took seven posts (one more than analysts were predicting), with co-spokesperson Gustav Fridolin being made Education Minister. The next big challenge is the budget which the new government has to present to the Riksdag for a vote on 17 November. If this budget does not pass then the government collapses. This is a possibility, as the Alliance has said it will be proposing its own budget, as will the Sweden Democrats. Should the Sweden Democrats vote with the Alliance, the government will fail to pass its budget. This could lead to a re-election – which must be held within three months of the failed budget. Sounds like a series of the Danish political drama Borgen, which brilliantly portrayed the struggles of coalition governments and negative parliamentarism. Löfven may well regret not bringing the Left Party into government, but this could be too late now. Prime Minister Löfven shouldn’t get too comfortable until after the budget vote.